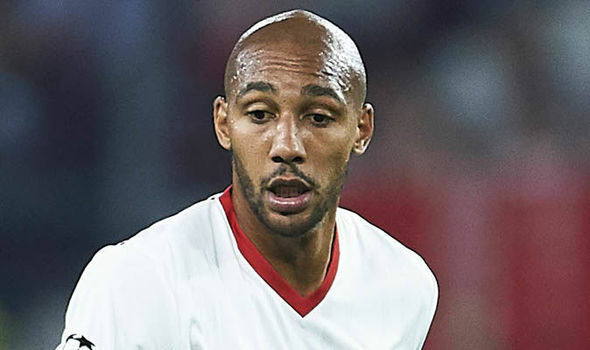 According to the Express, Sevilla director of football Joaquin Caparros has made it clear Arsenal can only sign Steven N’Zonzi this summer if we meet the midfielders £35m release clause. Unai Emery is gearing-up for a busy summer as he looks to revamp the squad left behind by Arsene Wenger and we’re expected to sign at least one new central midfielder. Santi Cazorla has left the club to rejoin Villarreal, Jack Wilshere is set to follow him out the exit door after failing to agree terms over a new deal while the future of Aaron Ramsey is also in doubt. Emery reportedly wants to add a physical presence to the middle of the park and speculation in recent days has linked us with a move for Sevilla’s 6ft 5in beast, Steven N’Zonzi. Our new head coach knows N’Zonzi well from their time together at Sevilla where they won the Europa League and it seems Emery is now keen on being reunited in north London. The Express says Arsenal have now been told what it will take to sign the 29-year-old after Sevilla’s director of football Joaquin Caparros confirmed they will be forced to sell if we meet N’Zonzi’s £35m release clause. “Is that a rumour or is it true?” Has Unai Emery called you? “Well, as a successful man, Unai Emery knows what line the club keeps. “If he wants N’Zonzi, he will have to call and put the bid in. And the bid is the clause. N’Zonzi would certainly add a physical presence to our midfield and he has experience in the Premier League having played for Stoke and Blackburn but £35m is a lot for a player who’s approaching 30. Emery reportedly has a transfer budget of around £50m-£70m and the Express says he’s eyeing a £16m swoop for Borussia Dortmund centre-back Sokratis Papastathopoulos having already snapped up Stephan Lichtsteiner on a free transfer today. So the majority of our budget would be blown if we pulled off a double swoop for N’Zonzi and Papastathopoulos and it wouldn’t leave much left over to strengthen other areas of the squad.